Bates College has been awarded a three-year, $450,000 grant for faculty development from The Andrew W. Mellon Foundation of New York, N.Y. The Mellon Faculty Innovation Fund will support Bates faculty in three areas. Two of these are new, interconnected program areas related to important initiatives at Bates: the implementation of the college’s new General Education curriculum, and the infusion of diversity into the overall academic program. The third area is continuing support for faculty scholarship and research. “The Mellon Foundation’s award recognizes our substantial success in attracting and retaining an outstanding faculty committed to academic excellence and intellectual rigor,” noted Bates President Elaine Tuttle Hansen. Bates introduced new General Education requirements with the class entering in September 2007. By autumn 2010, the requirements will apply to all students. Among other facets, the new academic program emphasizes interdisciplinary study by requiring students to complete two “general education concentrations” — clusters of four courses that cohere around a common theme, problem or principle. 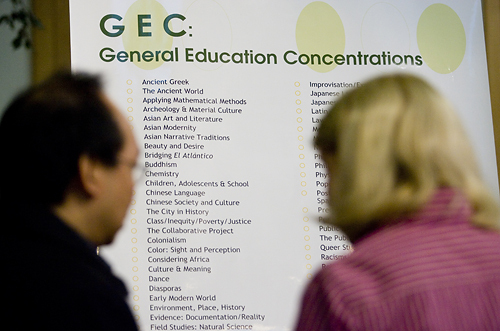 The GEC concept will help students examine more deliberately the relationships among ideas presented in different courses and disciplines. Bringing ideas into new juxtapositions and configurations, the concentrations will foster complex and innovative approaches to solving problems as well as a more coherent learning experience. Mellon funds will support the implementation of the new requirements, particularly the development of the concentrations and their component courses. The grant, too, will support a greater presence in the academic program of issues around all aspects of diversity. Specifically, Mellon funds will enhance GEC development relating to diversity, the creation of teaching tools and strategies for bringing materials pertaining to diversity into the curriculum, and the further development of faculty leaders to insure the success of Bates’ Benjamin Mays Initiative, a comprehensive effort to make a Bates education even more accessible to qualified learners from all backgrounds. Finally, in supporting faculty scholarship and research, Mellon funds will allow more tenured faculty to undertake activities such as long-term research planning, writing scholarly papers and grant proposals, or undertaking the early stages of new research projects. In all three areas, beginning in the current academic year, the Mellon Faculty Innovation Fund will support faculty development seminars, research and pedagogy initiatives, support for related travel, and the extension of the Mellon Learning Associates program, which makes expert practitioners in a wide range of fields available to students as teachers and consultants. “We expect and encourage faculty to use multiple and interesting combinations of these vehicles over the course of the grant period,” said Jill Reich, dean of the faculty. This latest Mellon grant to Bates continues a partnership that began in 1970, when the foundation awarded the college a grant to enlarge the faculty and increase faculty pay. Since then, Mellon has supported Bates efforts to develop its curriculum, undertake collaborative programs with peer colleges and interact more closely with the Lewiston-Auburn community.